We are very lucky and used to having a LOT of STUFF. It hasn't always been this way - humans used to live a much more simple life before we built machines and factories capable of producing 'stuff' at affordable prices. These days it is cheaper to buy a new 'thing' than get the old one fixed. Where does the old one go? 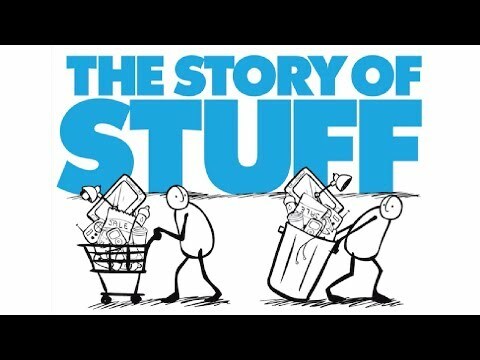 Have a look at 'The Story of Stuff' animation that explains why we have SO much stuff and how it is damaging our planet. Check out these other links to learn about energy and how we use it. SO, we need some new ideas and we need to change our behaviour. Have a look at this clip from the Carbon Nation movie - even the US army is looking for alternative sources of energy because it makes sense, even if you're not convinced by climate science. Does this give you any ideas for your video or persuasive writing? Here's a quick overview of our energy history. Watch the video to learn about the decisions we have made, and the consequences of our actions. In Australia our energy comes from a range of different sources. When it's sunny, our solar panels soak up the rays and convert them into electricity. Weather turning bad? Gale whipping up? Not to worry, that chilling breeze isn't just giving us pneumonia - it's turning the blades of wind turbines across the nation. Just a little too chilly? Maybe the heat from that coal we're burning can keep us warm. And if all else fails, there's always the prospect of nuclear energy in the future. Check out the photo story of the sources of energy used in Australia by the Australian Popular Science website. How much energy do we use for clean water? You might not realise it, but it takes a lot of energy to supply fresh water, and we consumer a lot of water without even realising it. Did you know it takes 200 litres of water to make just one take away coffee? Take a look at the video from our friends at WWF. You can read more about the water cycle and water management in the Pearson Science links.